Indigenous communities in villages in the forested interior of Wondiboi, Naikere and Kuriwamesa Districts in Wondama Bay Regency, still feel traumatised by the ‘Bloody Wasior’ events which took place in 2001. Even now they are unable to forget the murders, the tortures, the freedom usurped, the rapes, the forced disappearances, being forced to flee, the houses and possessions burnt. In its 2003 report, the National Human Rights Commission’s Team to Study Human Rights Problems in Papua concluded that sufficient initial evidence had been found to suppose that a gross and extensive human rights violation had occurred in Wasior, which should be categorised as a crime against humanity. The bloody Wasior incident started with two logging companies, PT. Darma Mukti Persada (DMP) and CV. Vatika Papuan Perkasa (VPP), which had been operating in the Naikere and Wondiboi areas since 1992. The companies, which had started work without the support of the local indigenous communities, proceeded to clear the forest, felling the trees and transporting the forest’s natural riches out of the area. 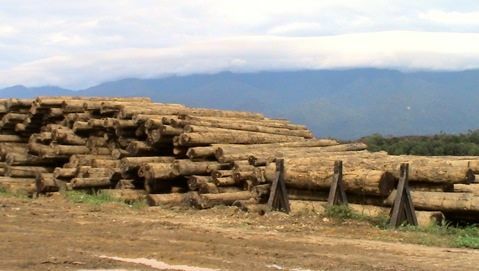 When met at the testimonial hearing Human Rights Commission’s National Inquiry, Bernad, an employee of Wondama Bay’s forestry service, told of how “PT DMP was operating without an environmental impact assessment, everything had been arranged by the central government, and the Wasior sub-district administration just accepted it”. In 2009, amidst the chaos of demands to reform government practices, the Forestry Ministry issued a new logging permit (IUPHHK-HA) to PT Kurnia Tama Sejahtera, with document reference SK.648/Menhut-II/2009. It was for a location in PT DMP’s former concession and covered an area of 115,800 hectares. Although the debts of the past had still not been paid off, and the issue of rehabilitation and justice for the victims had yet to be settled, the government issued this new permit to exploit forest resources, kindling questions about whether it was really serious about protecting indigenous people’s rights. In the National Human Rights Comission’s testimonial hearing on 29th November, Kostan Natama, an indigenous community leader from Sararti village, testified “The government does not value or protect our rights. The government issues permits without consulting us, just as the company PT KTS also never consulted the community. The company said it would not log forests belonging to the Mairasi indigenous people in Sararti village. In fact, PT KTS cleared the forest and felled trees in Sararti just as they pleased”, Natama explained. The Mairasi indigenous people in Wombu and Sararti have protested several times because important sites have been cleared and the low levels of compensation. PT KTS did not settle the community’s demands or arrange a fair benefit-sharing mechanism, instead the company just invited police and military forces to guard the logging compound and the company’s basecamp. The trauma of the past violence meant that the community did not feel free to denounce the company’s behaviour. PT KTS is a subsidiary of the Artha Graha Group, owned by Tommy Winata (TW), with its head office on the 27th floor of the Artha Graha building, Jalan General Sudirman 52-53 Jakarta. Tommy Winata’s other logging company in the land of Papua is PT Papua Satya Kencana (permit number SK.647/Menhut-II/2009, dated 15th October 2009), which is located in Bintuni Bay Regency and covers an area of 195,420 hectares. TW’s business empire has expanded and is well-known to be close to military circles. TW is involved with developing military infrastructure, from building barracks to supplying goods to military bases in Papua. TW’s business enterprises partnered with Yayasan Kartika Eka Paksi, which is owned by the army, to build the SCBD megaproject (Sudirman Central Business District) in Jakarta. TW’s competitors accuse him of using the military to facilitate his businesses. In late January 2013, the thing which the community feared and had hoped not to see again, happened once more. Military troops stationed at PT KTS’s logging compound struck Yulian Kiri and then off-and on throughout the day staff came from the base camp to the compound and beat and harrassed Yulian until he was black and blue, swollen and vomiting blood. His hearing was damaged and has never recovered. At the same time, army staff at the 48km post also physically harassed and threatened Elias Natama and Absalom Natama just because they were insisting to be brought home to their village from the logging compound. Elias was punished with 100 push-ups and had to stand below a flagpole. Elias explained what happened to Kostan Natama, who related “the squadron commander, his deputy and one other solider each struck him at least nine times in the face, his solar plexus and bones were broken, and he was struck twice with a large rattan rod the size of a snooker cue. The staff ordered him submerged in mud for 30 minutes”. Elias and Absalom Natama were threatened with being shot dead because the two were believed to be provoking the community to shut down PT KTS’s operations. The soldier said “If the company is shut down, it will be you that we shoot first, and then we’ll finish off the people from the two villages (Sararti and Wombu)”, explained Kostan Natama, as he related the victims’ testimony. The community did report these violent incidents, but local government, the Papuan People’s Assembly (MRP) and the police never took any action, neglecting the victims. Just as in the ‘bloody Wasior’ crime against humanity, the perpetrators and responsible institutions have remained out of the law’s reach. As of today, there is still a military post occupying the Naikere district office in Naikere village, beside the route of the only road from the village to Wasior city. The people of Wombu and Sararti are very nervous to pass the army post, which is guarded by armed soldiers.. They are forced to sneak past when they visit their families or children which go to school in Naikere village, and they have to put off going to the health clinic for treatment. “The people are afraid to pass the army post, whose officers often ask people questions or watch over them . They sometimes hide when they are carrying produce from their gardens or the forest, and are scared to go to the clinic”, said Stevanus Marani, another community member who has been affected. The indigenous community in this area are asking the government to close down PT KTS and withdraw the military from the villages, as they are only making the community nervous and feel unsafe. “We also ask the government to restore and rehabilitate the rights of the victims of the violent incidents in Wasior in 2001” said Yunus Surumi from Wondiboi, another victim who gave evidence. This entry was posted in Around West Papua and tagged CV Vatika Papua Perkasa, Inquiri Nasional, Komnas HAM, Kuriwamesa, Military violence, Naikere, PT Darma Mukti Persada, PT Kurnia Tama Sejahtera, Teluk Wondama, Tommy WInata, Wasior Berdarah, Wondiboi. Bookmark the permalink. Comments are closed, but you can leave a trackback: Trackback URL.